Sometimes that dull, throbbing pain in your face is a sign that you’ve caught the dreaded common cold, and your sinuses are now inflamed. It's tricky though to differentiate between sinus pain and a migraine or tension headache, since all three can produce similar types of pain. Let's learn more about sinus headaches and what you can do to ease your pain and accompanying symptoms. How Do I Know if my Headache is from my Sinuses? A sinus headache is typically felt in the cheekbones, forehead, and behind the bridge of the nose. The pain is usually constant and throbbing. Typically a sinus headache worsens when you move your head or bend over. The pain may also intensify when you lie down. Sinus headaches may be worse in the morning and improve during the day as mucus drains. Some individuals are also more likely to experience sinus headaches in colder, rainy weather. A sinus headache is usually caused by a viral infection and may be accompanied by other symptoms including a sore throat, cough, fatigue, and a nasal discharge. A feeling of fullness in the ears and facial swelling may also occur. Sometimes, the sinuses will be tender when you press on them—like on the forehead or cheeks. If the sinus headache is caused by a bacterial infection, a high fever or tooth pain may also be present. Most sinus headaches are caused by allergens, environmental irritant, or infections, especially viral infections, like the common cold. In order to determine the cause of your sinus headache, your doctor may conduct a few tests. The first thing your doctor will do is examine your sinuses. Your doctor may use her finger to tap on your sinuses to determine if they are tender. She might also use a small light to look inside your sinuses through your nose for swelling and drainage. If your doctor suspects a sinus infection, she may take a sample of your mucus in order to test it for bacteria or rarely, a fungus. A sinus infection that is caused by a bacteria will typically be treated with antibiotics, while an infection caused by a virus does not require antibiotics. 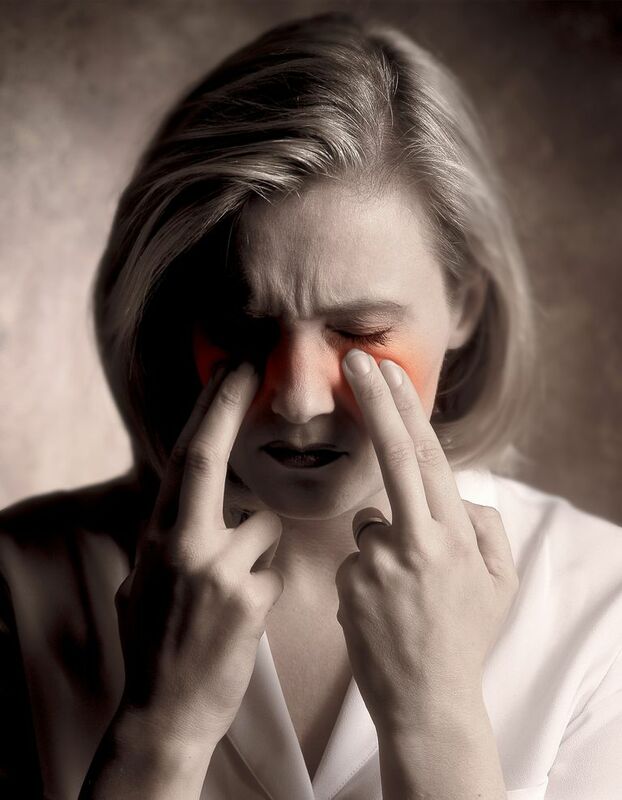 If you suffer from chronic sinus headaches, your doctor may also send you for a CT or MRI of the sinuses. If a sinus infection is ruled out, your doctor may wish to examine you for other symptoms. Sometimes it's discovered that a tension headache is the likely culprit, especially if a person also has a feeling of tightness around their head. A migraine can also cause sinus-type symptoms, but tends to be more intense and occur with other symptoms, such as nausea, vomiting, and sensitivity to light and sound. Allergies, such as hay fever, may also cause a headache due to nasal congestion. If allergies are suspected, your physician may send you for allergy testing. Treating the allergies often helps alleviates sinus headache symptoms. In rare instances, symptoms of a sinus headache can signal a tumor or cluster headache. This is why with any sort of headache or facial pain, your doctor will likely also do a neurological examination. For mild sinus headaches that last a few days, at-home remedies can be effective at easing the pain. Remedies, like taking a hot, steamy shower, can help ease a person's congestion by facilitating drainage of the nasal passages. Your doctor will also recommend rest and lots of fluids. Some doctors recommend using a saline-based nasal irrigation system like a neti pot. Over-the-counter medications, like decongestants, antihistamines and pain relievers, may also help. Sometimes your doctor will prescribe a corticosteroid nasal spray, especially if you have a history of allergies. If your doctor suspects a bacterial sinus infection, she will prescribe you an antibiotic, in addition to recommending the above remedies. Sinus surgery by an ENT, or ear, nose, and throat doctor is a last resort option for people with chronic sinusitis. Chow AW, Benninger MS, Brook I, Brozek JL, Goldstein EJC, Hicks LA et al. IDSA Clinical Practice Guideline for Acute Bacterial Rhinosinusitis. in Children and Adults. Clin Infect Dis. 2012 Apr;54(8):e72-e112. Eross, E., Dodick, D., & Eross, M. (2007). The sinus, allergy and migraine study. Headache, 47:213–24. Patel ZM, Setzen M, Poetker DM, DelGaudio JM. Evaluation and management of "sinus headache" in the otlaryngology practice. Otolaryngol Clin North Am. 2014 Apr;47(2):269-87.